This lens is almost identical to its predecessor, the F 50/2.8 Macro. It shares all its positive features, and improves on one point — the manual-focus feel. The FA lens features a small dial that is connected to a tightening clamp. Engaging the clamp increases the friction of the focusing ring; disengaging it lowers the resistance for better and faster AF operation. The lens is as solidly built as its predecessor, except for the newly-added clamp dial which is a bit flimsy, and moves away from the "on" position too easily. Optically this lens is virtually perfect. It is extremely sharp, corner to corner, at 1:1 or at infinity. Wide open it is better than many lenses at their optimal apertures, and when stopped down to f/5.6 or f/8, it matches the very best. 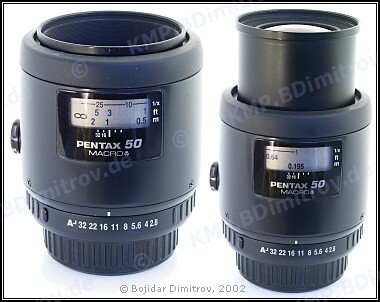 It even slightly outperforms Pentax’s 100 mm macro lenses. The lens’ colors are very neutral, the contrast is excellent, and there is no noticeable distortion. Light fall-off is barely visible wide open and non-existent when the aperture is closed down a stop or two. Bokeh is very smooth, and flare resistance is superb.